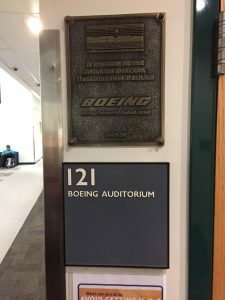 The Boeing Auditorium is currently a great area for presentations and guest speakers. 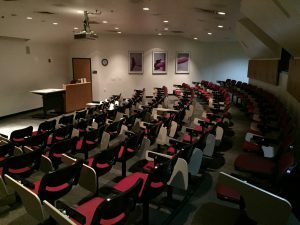 The auditorium seating provides a good atmosphere for students to comfortably sit and take notes as they watch the presentation. However, now we are currently in the works of redesigning this outdated room to better accommodate students. This room will have better lighting and create a more welcoming environment for students to listen to speakers. Below are the proposed New Boeing Auditorium designs that we look forward to creating in the future. Everyday the Udvar-Hazy building is striving to improve for our current and future students.